The gallbladder is a sack-like structure that is just below your liver. The gallbladder lies beneath the lower end of the right side of your rib cage. The function of the gallbladder is to store bile, which is made in the liver and is carried to the bowel by the bile duct. The gallbladder is attached to the bile duct by a tube called the cystic duct. Bile enters and leaves the gallbladder through the cystic duct. The gallbladder stores bile that is made by the liver, and releases the bile into the bowel after a meal. Bile is important for digestion. But, the gallbladder does not serve a vital function in the human body: you can live easily without your gallbladder. After removal of the gallbladder, bile flows directly into the bowel. Removal of the gallbladder does not usually cause any digestive problems. There is no restriction on food after a gallbladder operation. Digestion continues to take place as it did whilst the gallbladder was in place. Most people can eat more comfortably after removal of a gallbladder that contained stones. But occasionally, you can get diarrhoea because of poor absorption of bile acids from the bowel after removal of the gallbladder. Why do stones form in the gallbladder? Gallbladder stones – called gallstones – develop because of deposition of crystals of cholesterol, bile pigments, calcium and other substances from bile. The crystals get deposited and enlarge to form stones when there is change in the composition of bile, or if the gallbladder does not empty properly. There are many risk factors for the formation of gallstones. The risk is higher is women than in men. The risk is increased by pregnancy, oestrogen hormone treatment, certain genetic traits, obesity and rapid weight loss. Certain blood diseases, called haemolytic anaemias, increase the risk for pigment gallstones. The composition of the gallstones does not change treatment. There is no good evidence that change in life-style can prevent or dissolve gallstones. What problems are caused by gallstones? You get gallbladder pain in the upper part of your abdomen (tummy), usually on the right side. Eating fried food or other high-fat food often brings on the pain. Along with pain, you can get nausea, bloating of your abdomen and flatulence. You get a sharp, spasm-like pain in the upper right side of your abdomen. The pain often radiates from the front to back, just under the right side of your rib cage. The pain may radiate also to your right shoulder blade. Usually, the pain is most intense for about 30 minutes, and then wears off. This is acute inflammation of the wall of the gallbladder (gallbladder infection). You can get a constant pain in the upper right side of your abdomen, fever and feeling of being generally unwell. Acute cholecystitis can lead to several complications. You could get empyema of the gall bladder. This is a condition in which the gallbladder gets filled with pus, like an abscess. You could get gangrene of the gallbladder. Here, there is disintegration of a part of the wall of the gallbladder. Bile can leak out from the gallbladder and cause peritonitis (infection of the lining of the abdomen). The gallbladder gets filled by clear, mucous-like liquid. A mucocoele forms because the outlet of the gallbladder – the cystic duct – is blocked by a gallstone. Jaundice is a condition in which there is yellowish discolouration of your skin and eyes because of high blood levels of bilirubin. Bilirubin is a pigment that is made in your liver and it is carried in the bile to your bowel. Bile passes from the liver to the bowel through the bile duct. Obstructive jaundice is a condition in which the bile duct is blocked by gallstones that passed out from the gallbladder into the bile duct. The bile backs up in the ducts, and bilirubin refluxes back into the blood stream and causes jaundice. This is a condition in which there is obstructive jaundice and infection in your bile ducts. Cholangitis should be suspected if you get pain in the upper right side of your abdomen, jaundice and fever. The pancreas is a gland that lies on the back wall of your abdomen, just below the liver. The pancreas makes digestive juices that are carried to the bowel by the pancreatic duct. The pancreatic duct and the bile duct have a common opening into the bowel. Stones from the gallbladder can enter the bile duct and pass through the common opening of the pancreatic duct and the bile duct. The stones can temporarily block the pancreatic duct and this causes inflammation of your pancreas gland. This is called gallstone pancreatitis. You can get pain in the upper part of your abdomen and vomiting. Pancreatitis can lead to several complications. Rarely, a large gallstone may erode through the gallbladder into the first part of the small bowel, called the duodenum. This forms an abnormal passage, called a fistula, between the gallbladder and the duodenum. The gallstone, which has now entered the bowel, can cause blockage of your bowel. Blockage of the bowel by a gallstone is called gallstone ileus. Gallstones (gallbladder stones) are diagnosed by doing a scan of your gallbladder. Most commonly, it is an ultrasound scan. Ultrasound is an accurate test for stones in your gallbladder, but it may not detect stones that have passed into your bile duct. Stones in the bile duct are suspected if the duct appears dilated (swollen) on ultrasound scan. Also, bile duct stones may be suspected by abnormalities in blood tests (called liver function tests). The bile ducts can be checked by a special MRI scan, called called MRCP (Magnetic Resonance Cholangio-Pancreaticography). The treatment of gallstones is an operation to remove the gallbladder. The operation is done by laparoscopy (keyhole surgery) and it is called Laparoscopic Cholecystectomy. Non-surgical treatments, such as fragmentation of the gallstones by shock waves or dissolving gallstones by medicine, have low rates of success and high risk of re-formation of the gallstones. Also, removal of gallstones and leaving the gallbladder in place is not done because it is very likely that there would be further problems. Does everyone with gallstones need an operation? The decision about whether or not to do an operation for gallstones (gallbladder stones) depends mainly on your symptoms. You may have Symptomatic Gallstones, Asymptomatic Gallstones or Gallstones with Atypical Symptoms. You have symptoms that are typical for gallstones, like biliary colic. Or, you have had a complication of gallstones, like acute cholecystitis, obstructive jaundice, cholangitis or acute pancreatitis. Laparoscopic cholecystectomy is generally advisable, unless you have medical conditions that make the operation excessively high-risk. You do not have any symptoms from your gallstones, and you have not had any complication from gallstones. The gallstones were found incidentally during a scan of the abdomen for some other purpose. It is difficult to predict whether asymptomatic gallstones will cause problems in the future. Generally, an operation is not recommended for asymptomatic gallstones. It is better to wait and watch rather than to do pre-emptive surgery. But, there are some unusual circumstances in which an operation may be desirable. The decision about surgery can be difficult if your symptoms are not typical of gallstones. You may have generalised pain in your upper abdomen (tummy), bloating or other discomfort that fits in with dyspepsia (indigestion). You may have had an endoscopy to check for a stomach ulcer and acid reflux. If you have gallstones with atypical symptoms, it is not certain that you will benefit from laparoscopic cholecystectomy. Some people with atypical symptoms are helped by an operation, but careful decision-making is necessary. Atypical symptoms may not improve after surgery. It may not be possible to pinpoint the diagnosis of these atypical symptoms. What is the treatment for stones in the bile ducts? A special telescope-like camera is passed through your mouth, and the stones are removed by passing instruments through the opening of the bile duct into the bowel. This procedure is called ERCP (Endoscopic Retrograde Cholangio-Pancreaticography). Usually, ERCP is done before the laparoscopic cholecystectomy operation. But, bile duct stones may be found during the operation. An x-ray of the bile ducts, called an intra-operative cholangiogram, is done usually during the operation because we know that pre-operative tests may not always pick up bile duct stones. Post-operative ERCP may be needed if stones are found on the cholangiogram. Bile duct stones can be removed by doing surgery on the bile ducts, along with removal of the gallbladder. This can be done by keyhole surgery. There are various pros and cons for ERCP versus bile duct exploration, and the choice depends on your individual circumstances. Laparoscopic Cholecystectomy is removal of your gallbladder by keyhole surgery (laparoscopy). The operation is done under general anaesthesia, and usually takes 45 min to one hour. Most patients can go home on the same day. 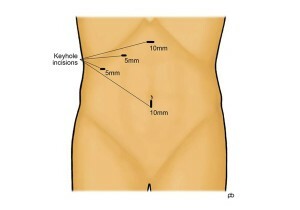 Four keyhole sized cuts are made on your abdomen (tummy). The gallbladder is separated from the liver, and the blood vessels to the gallbladder are divided securely. The gallbladder is attached to the bile duct – the tube that carries bile from the liver to the bowel – by another tube called the cystic duct. In order to remove the gallbladder, the cystic duct is cut and sealed by surgical clips or stitches. The gallbladder is then placed in a special bag and removed via the keyhole at your bellybutton. During the operation, an x-ray of the bile duct is done, after injecting a special dye into the bile duct via the cystic duct. This x-ray is called a cholangiogram. The x-ray helps to make sure that the ducts have been identified correctly and it looks for any stones that might have slipped into the bile duct. What are the risks from Laparoscopic Cholecystectomy? Most people may a straightforward recovery and serious complications are rare. 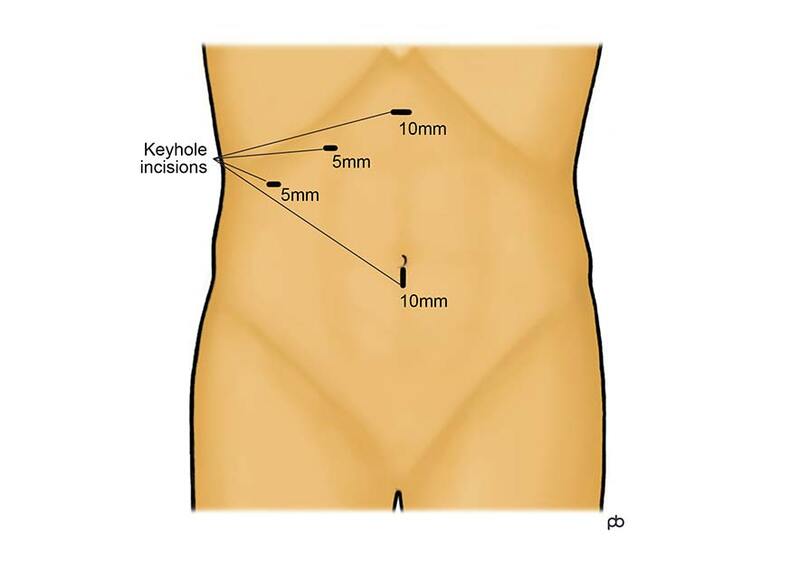 But, all keyhole (laparoscopy) operations on your abdomen (tummy) carry some risks. There is some risk of excessive bleeding whilst separating (dissecting) the gallbladder from the liver. A rare but very serious risk is injury to the bile duct. This is the tube that carries bile from the liver to the bowel. Bile can leak out in to the tummy from the bile duct and cause serious infection. The treatment of bile duct injury can require endoscopy (called ERCP) and major corrective surgery. 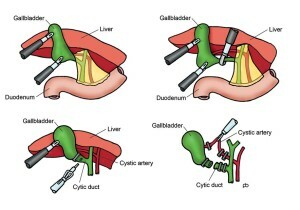 If the gallbladder is very stuck to the bile duct, then a sub-total cholecystectomy is done. 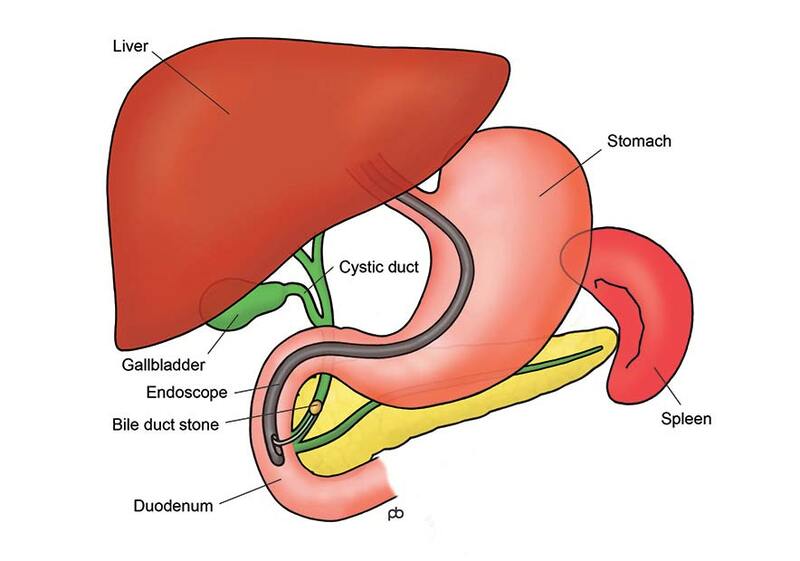 Here, a small part of the wall of the gallbladder is left on the bile duct in order to protect the duct. A polyp is growth from the wall of the gallbladder. The concern is about the risk of transformation of a polyp into cancer. But, not everyone with gallbladder polyps needs an operation to remove the gallbladder. In some cases, no action is needed or periodic monitoring by ultrasound scan may be sufficient. For others, a cholecystectomy operation is advisable. The decision about whether or not to do an operation depends on several factors, such as the size, shape and numbers of polyps, symptoms and age.